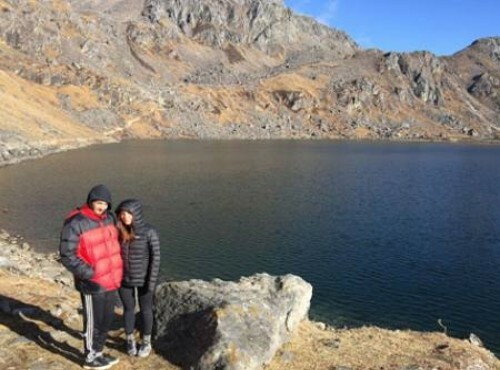 Langtang Valley trek begins with two days in Kathmandu, during which we will review the clothing and gear needed for an enjoyable and safe experience. You will also have some time to do a bit of sight-seeing in this amazing historic city. We then depart from the hustle and bustle of Kathmandu, driving north through the Helambu area to Syabrubesi, the gateway town for treks into the serene Langtang Valley. Our trekking route will follow the course of the Langtang Khola, the river running through the Langtang Valley, which we will cross several times on suspension bridges. Surrounded by gorgeous scenery, we can expect to encounter an unusual variety of native wildlife, such as yellow-throated martens, wild boars, langur monkeys, and red pandas. Catching occasional glimpses of Langtang Lira, we will hike past some stunning waterfalls and through forests of both hardwood trees as well as rhododendron (Nepal's national flower) en route to the settlement of Changtang, also known as Lama Hotel. After overnight here, our adventure continues as we ascend gradually to the town of Langtang, the headquarters of Langtang National Park, and a picturesque little town in its own right. Here you will encounter traditional stone and wood houses with flat Tibetan-style roofs and carved windows, overlooked by a pair of large waterfalls emerging from the rock wall above the town. Having achieved a sufficient level of acclimatization by this point, our adventure continues on up to the monastery and settlement called Kyanjin Gompa. On our second day here we will hike up to Tserko-Ri, to enjoy a fabulous Himalayan panorama at top this 5,000m/16,400' viewpoint. We then head back to Syabrubesi, enjoying the same route from a new perspective. After the drive back to Kathmandu, we will enjoy a farewell dinner before final departure the next day. Day 02: Kathmandu: Sightseeing Tour and Trek Preparation. he exciting day begins with a cultural tour to various mediaeval sites in Kathmandu. You will drive to visit the UNESCO listed world heritage sites - Pashupatinath Temple (the biggest Hindu shrine), Boudhanath (largest Buddhist Stupa in Nepal), Swayambhunath (a fine Buddhist stupa at the hill top of Kathmandu) and the Kathmandu Durbar Square (an open museum and abode of Kumari). Coming back from the sightseeing, you will take part in a short briefing and trip preparation. Overnight at hotel. Following the Langtang Khola, we head from Syabrubesi to Lama Hotel. During the foot hill excursion, we walk through the rugged path and rhododendron forest of the Langtang National Park. This is a pocket zone of the red panda. Via Bamboo, we reach to Lama Hotel. Overnight at Guesthouse. We reach to the Langtang valley today via Ghoda Tabela. It is a gradual climb up viewing the beautiful sceneries of the green hills and picturesque Tamang villages. Langtang village is a unique and typical Tamang village, which is renowned for preserving the traditional values and cultural perfection. Overnight at Guesthouse. Today, we spend an exploration day and we hike to the Tserko Ri. We walk up to the moraine after breakfast, explore the Himalayan wonders. Mt. Langtang Lirung and other Langtang region peaks can be explored during the hike. Even we can experience the cultural prosperity of the ethnic Tamang in habitations. Overnight at Guesthouse. Leaving Kyanjin Gompa, we gradually descend to Lama Hotel. It’s a rugged trail and dotted with the rhododendron forest. Reach to bamboo and we take a rest. Overnight at Guesthouse. Adventure Club Trek will manage a farewell drive to the international airport for your final flight departure.